Blurb One of the best race maps that continue ISMC race series. Map that inspired by the cancelled project that made in post-apocalyptic USSR style. This project was launched in 2013 and used as a base Cube 2 Sauerbraten. 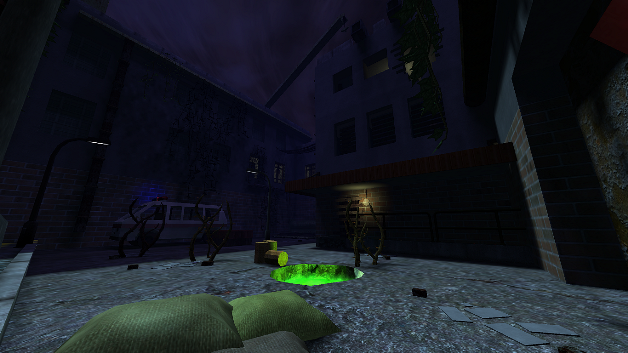 The project was inspired by “Picnic on the Roadside” by Arkady and Boris Strugatsky and also by game STALKER. The setting was chosen appropriately. Initially, only the single-player mode was planned, but with the change of engine to the Red Eclipse it was decided to do the multiplayer part (Deathmatch, CTF ect). Hundreds hours spent to make our maps look real. Most of stuff made by Gespent but i take part in creating some stuff too. At the initial stage, the team is not big, but at the end it spread to a dozen people, including a composer and two screenwriters. One of the screenwriters even told that he want write book based on his text. But because of the poor management in all aspects of development, work on the project was discontinued. Only a few assets remained, while the models were lost. In 2017 I started RSMC, union of people from Russia who like level design and editing in Cube 2 Sauerbraten and in this year Gespent made this map as tribute to the project. Nice to see some race map around again. It has some nice details which show that here has been spend time on the map. This feeling gets stronger due the lighting of the map. It's often not the best lighting, but it does enhance details and areas. I had to get used to the flow of the map sometimes. It takes a moment to know where you should be heading. Perhaps it's more realistic, but adding death-material in a race or defrag map is often a bad choice due the effort a player has to invest to reach a certain point, but then have to start all over again. That's why, rather use teleports. Take a proper name please. ISMC_race-10-Race1995_by_Gespent is not a name for a map, but rather the maptitle. Also, just package the map correctly. If you need some help with that, read the Packaging Guide. Yea. Death matherial can be a problem. But i prefered to keep use it since it used by Gespent too. It's possible to change death to the teleports but it's again can take to much hours of works and i prefer to spent this hours to the other maps rather then to the maps that already work. About file names - after this years i prefer use this format. Also for me long names isn't so big problem since i can use TAB for autocomplete. Plus this name feels more informative then bvdm_01 or DM_BS1 for me. Well, maybe it can be explained by taste preferences from my side. Also packaing can be idea. I forgot this rule here. There will be more cool race maps soon.